The Outdoor Trip Planner is your new best friend when it comes to planning the ultimate outdoor trip with friends, family, or even weathering the storm alone. This template was designed to make sure, that you have everything you need to quickly and easily enter your important travel information, such as camping location, gear, and other resources so you never miss a beat. Best of all, this document is completely free, all you have to do is click the link below and read the instructions on how to use this great template to plan your next outdoor excursion. Once you have your document downloaded, up, and ready to go, let’s begin by filling out the template with an example. Let’s say you have your trip all planned out. 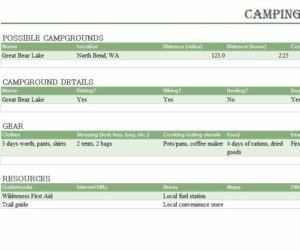 The first section of the Outdoor Trip Planner is where you can list your campgrounds. You can see that there is already an example for the “Great Bear Lake.” You will naturally list the address, distance from your home, the number of hours this journey might take, and the cost of your reservation. The next table allows you to enter more detail about your camping site. There are columns that list options for fishing, hiking, hunting, dog, and a playground. You can use these categories to pack your luggage accordingly. Go through and fill out “Yes” or “No” for the items that apply to your chosen campground. Now for the gear, every great outdoorsman needs some gear to help them along the way. Simply enter the items you want to bring with you. For example, this campground has some great spots for hiking, so you could bring some hiking boots along for the ride. Finally, you should always be prepared for accidents and plan ahead with some essential resources. The final column is where you can fill out all this information. The example lists a first-aid kit and a trail guide so you don’t lose yourself in nature, literally. Being prepared is all a part of the fun when it comes to outdoor activities.